The leaves are changing and kids are back to school before you know it Thanksgiving & Christmas Holidays are here. Time for a new dining set for the big meal. 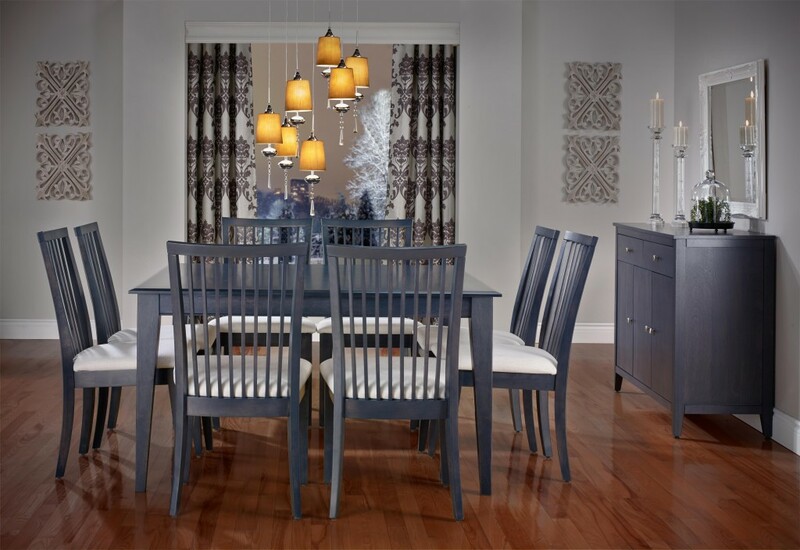 At Saugerties Furniture Mart you can find the Hudson Valley’s largest selection of Solid Wood dining furniture from Canadel and many Amish builders. 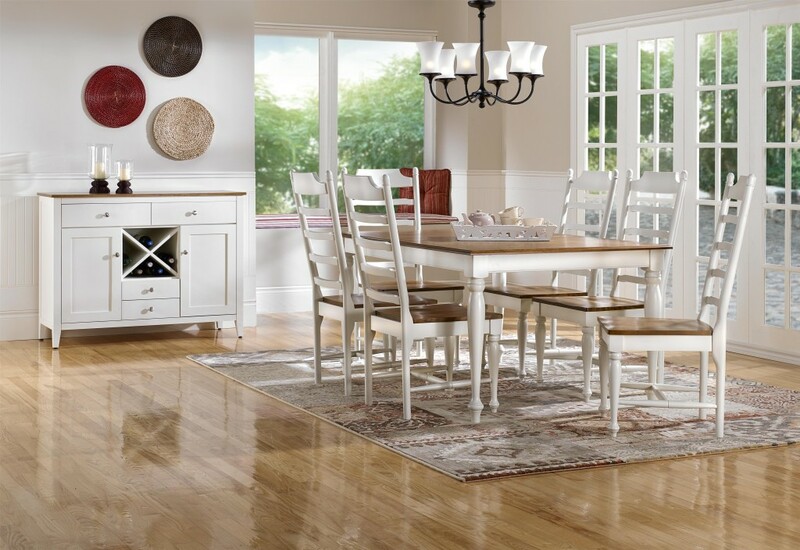 Every style from Modern to Rustic, sturdy chairs & bar stools, worry-free finishes and the ability to build a table to fit your space make shopping Saugerties Furniture for dining furniture a no brainer! Choose from a variety of North American Hardwoods, Birch, Oak, Maple, Cherry, Quarter Sawn White Oak, Elm and Hickory to match your decor. Rustic Farm tables, large round tables, rectangular and boat shape tables are the best sellers today plus we can add 10+ leaves for those really big family dinners! 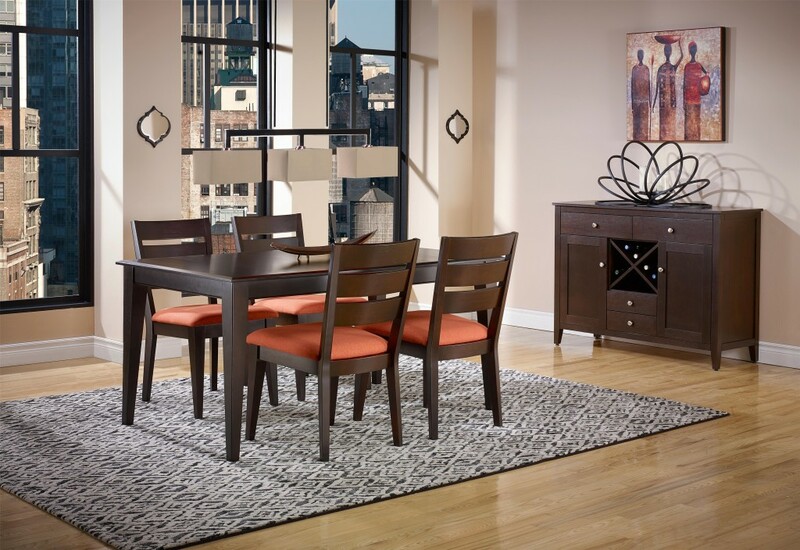 Stop by Saugerties Furniture Mart on Main Street in Saugerties to see our huge selection of quality dining furniture! Solid Brown Maple double pedestal with two-tone chairs! 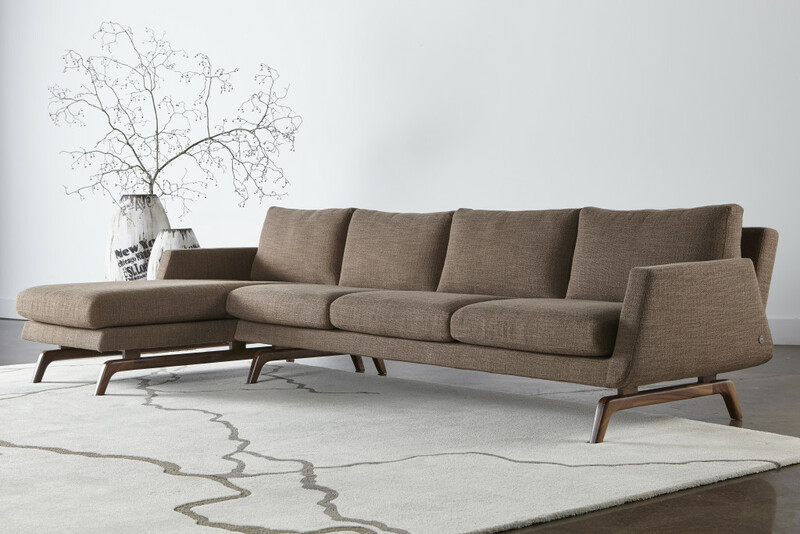 Fresh modern mid-century looks at Saugerties Furniture Mart! These great looking new styles are on our floor from Younger Furniture. 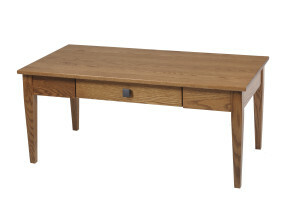 Younger is a family company who builds quality mid century & modern styled furniture from North Carolina. Modern styles with classic hardwood construction, heavy duty cushions and performance fabrics makes Younger the perfect choice for active family rooms. Clean simple lines, comfortable seating and affordability make Younger Furniture a great compliment to our expansive selection of living room furniture through out our 4 huge floors. We carry 10+ styles from Younger Furniture and their complete wall of fabrics. Custom orders are delivered in approximately 6-8 weeks. Stop by today at Saugerties Furniture Mart on Main Street in Saugerties and see the difference experience makes. 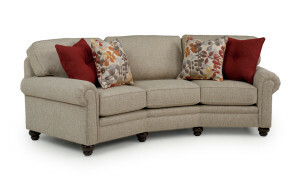 Let’s have a conversation about conversation sofas. Do you have a large room where a sectional is too big and a sofa too small? 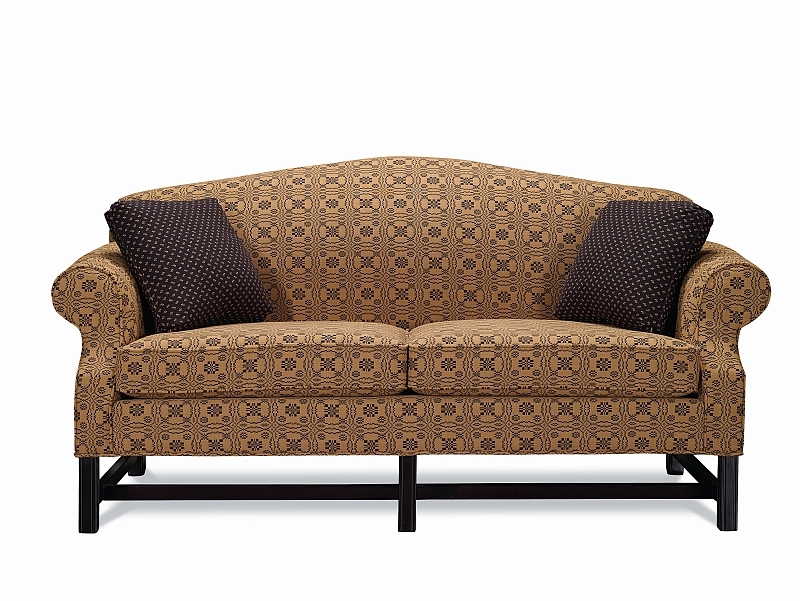 Take a look at our conversation sofas from Smith Brothers of Berne. 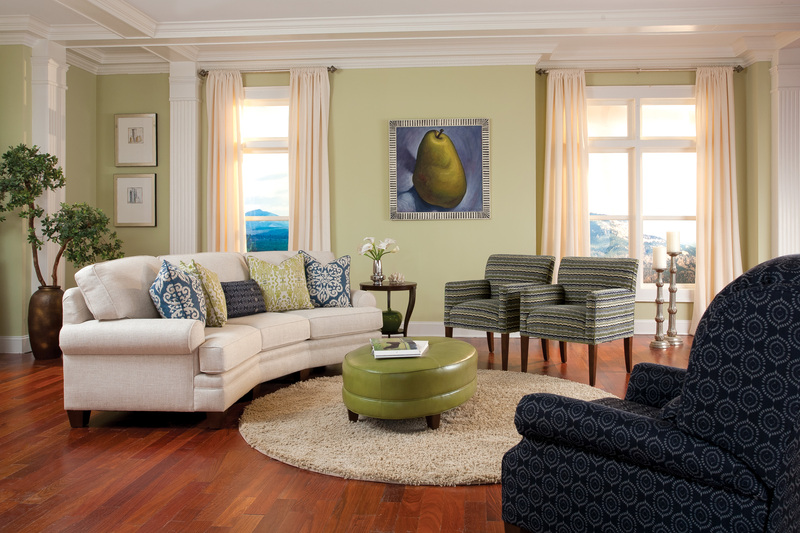 A conversation sofa has a beautiful curved shape and is typically about 24″ longer than a standard sofa. Most conversation sofas are in the 100-115″ range and look great facing large fireplaces or facing each other to create a great area for you guessed it …conversations! We carry a large assortment of styles from Smith Brothers of Berne Indiana that are available in the conversation configuration. All the Smith styles the 324, 393, & 5000 Build Your Own Series with a choice of Arm, Back and Leg styles are available in a choice of over 900 fabrics and 85+ top grain aniline leathers. Special orders are delivered in 35 days or less. 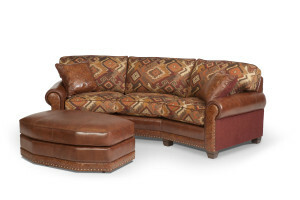 Here are some more examples of Smith Brothers of Berne conversation sofas. 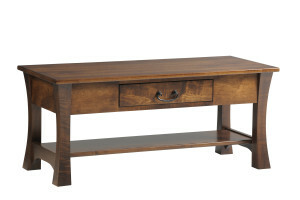 View our complete selection of Smith Brother’s living room furniture here on our website. Call or stop by 222 Main St, Saugerties NY 12477 to see our full selection of quality Made in USA furniture. Have you been searching for Primitive & Country style furniture? Look no further than Saugerties Furniture Mart! 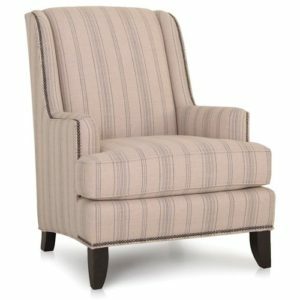 In addition to carrying the latest and greatest styles of American Made furniture we also carry the classics that fit into the historic styled homes in the area. Our Homespun collection from Lancer Furniture in NC offers a beautiful assortment of classicly designed primitive and country styles with unique fabrics that are so rare in today’s sea of micro-denier covered furniture. 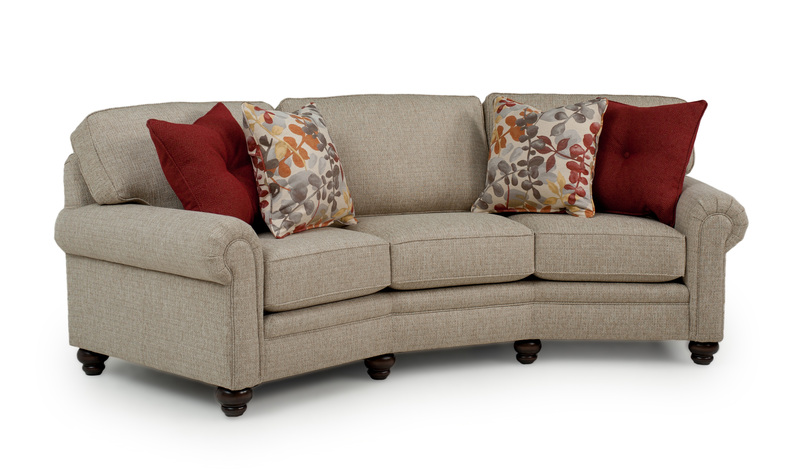 Each piece is built with an oak frame, sturdy coil spring base and lifetime warranted high-denisty foam cushions so your furniture will last for years to come. Stop in Saugerties Furniture Mart on Main St. in Saugerties to see our Homespun primitive and country style furniture for your home. We just received some new solid wood cocktail and end table groups from one of our favorite Amish workshops in Holmes County, Ohio These wonderful tables are available in a choice of woods, OCS stains & hardwares to match any decor. All of our Amish furniture features a “worry free” finish that resists staining and everyday use, plus it never needs to be polished! Since each table is custom built we can even customize the size or the function to meet your needs. Made in the USA by the Amish these tables are a wonderful value and will be cherished not just now but by future generations too! Stop by Saugerties Furniture Mart on Main St. in Saugerties to see our solid wood occasional tables and our 4 huge floors of furniture. 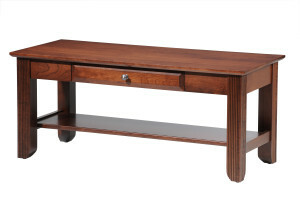 Below are a few of our best selling solid wood coffee and end table groups . 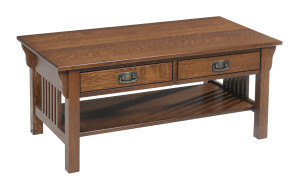 Click here for a full assortment of Made in USA by the Amish occasional tables. 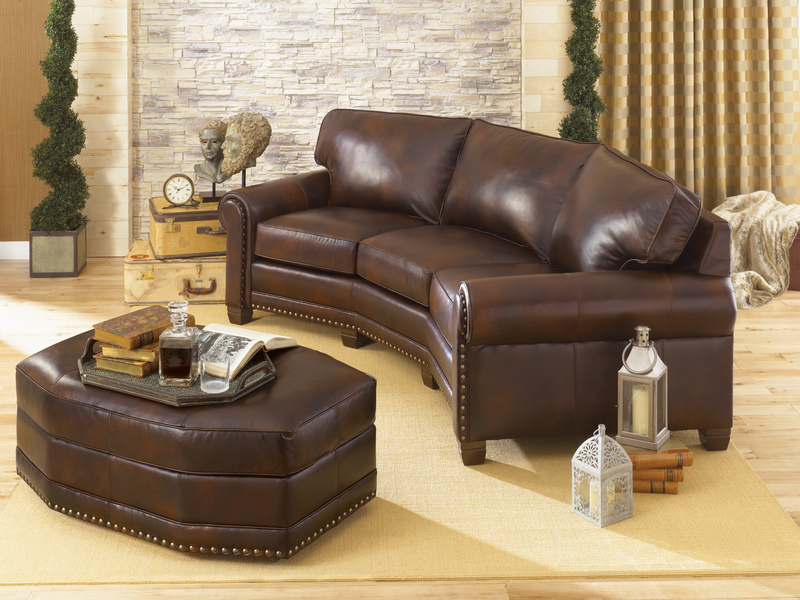 Made in USA with European contemporary style and American comfort the American Leather Nash living room collection is waiting to make a statement in your home. 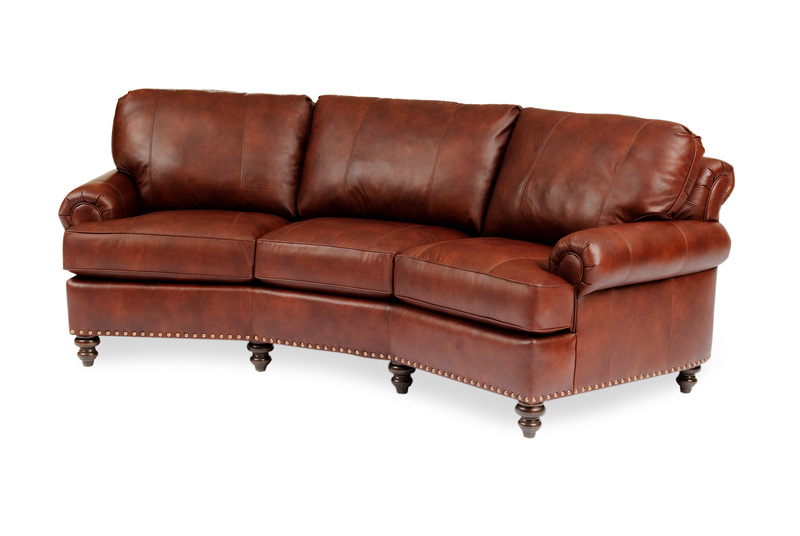 American Leather is made in USA with the finest materials and attention to detail. 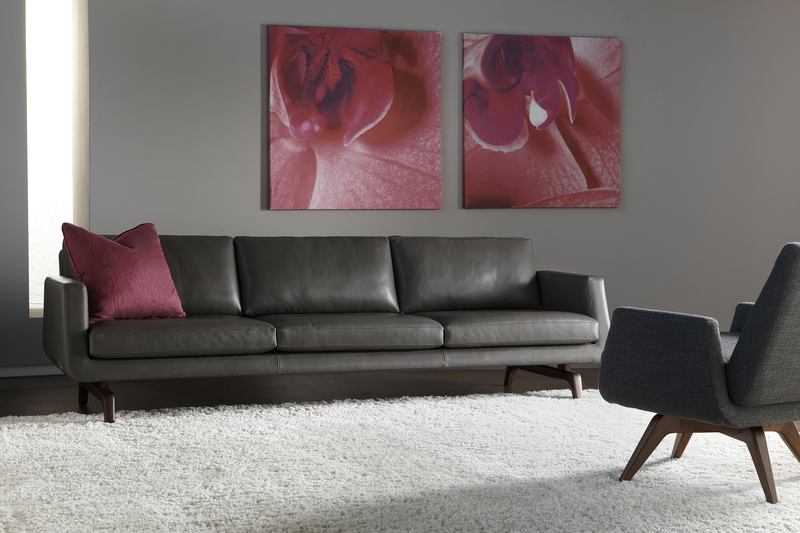 Our expanded collection of American Leather product includes the Nash collection with it’s contemporary lines & beautiful Walnut legs making this a real standout piece. 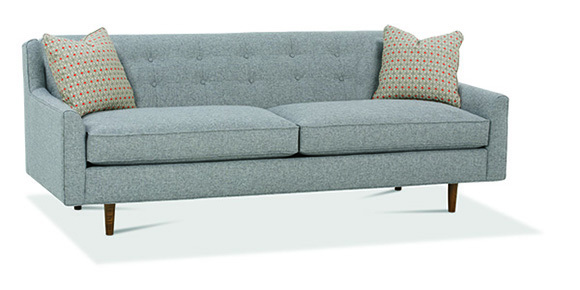 The Nash is available as a sofa in both 99″ & 84″ lengths and as a sectional in multiple configurations. There are many leather and fabric options to choose from. Special orders are delivered in about 35 days, made for you! 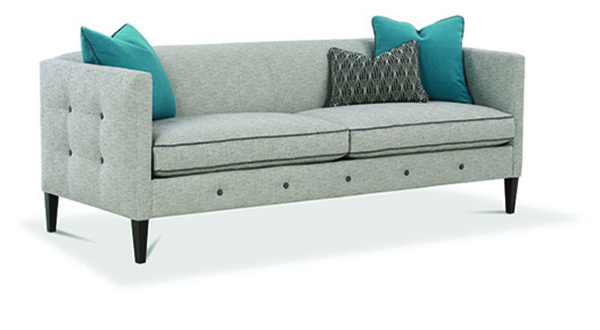 Click here for more information on the Nash sectional. 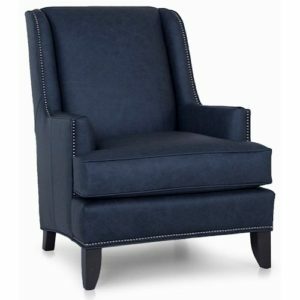 Looking for the biggest Made in USA recliner? We’ve got it, The Beast Bruticus Big Man’s Recliner from Best Home Furnishings is the one. 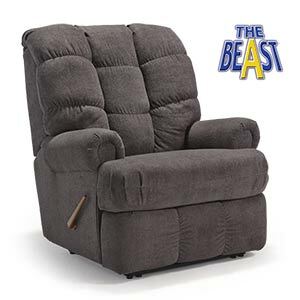 This extra durable Beast recliner features an extended padded chaise, heavy duty frame & 7 gauge steel mechanism tested to withstand over 400 pounds of everyday use. There’s plenty of room to sink into the extra soft cushion, pillowed by padded arms and thickly channeled back cushions. But you don’t need to worry about fitting this oversized recliner into your room, as it comes equipped with a wall-saver mechanism that saves space behind the recliner and ensures the safety of your wall. Extra-large Beast recliners are able to withstand 400 lbs of everyday use. The Beast recliner features heavy-duty, 7-gauge steel mechanisms and a double-dowelled hardwood frame. Double lumbar springs provide extra support where it is needed most, and the seat backs are extra tall. Built for comfort and built to last. Find this and other Beast Recliners @ Saugerties Furniture Mart on Main St in Saugerties. Selling quality Made in USA furniture for over 68 years we have the perfect seat for everybody! 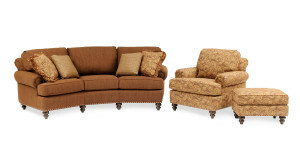 New styles from Rowe Furniture have arrived! 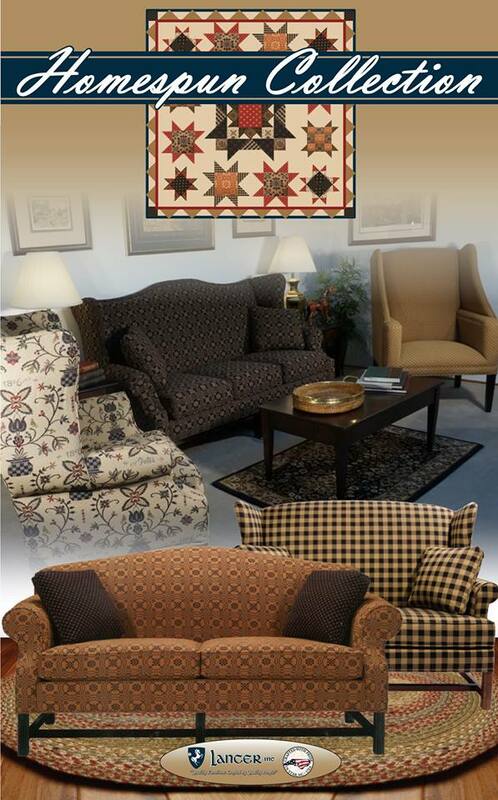 Rowe Furniture is made in the USA and committed to building a quality piece of furniture in a huge choice of fabrics. Their strength is lifestyle, mid-century and slipcovered styles like those from the Crate and Barn stores of the world, but for less money and they give you more fabric choices. We’ve carried Rowe for over 25 years and have hundreds of satisfied customers. 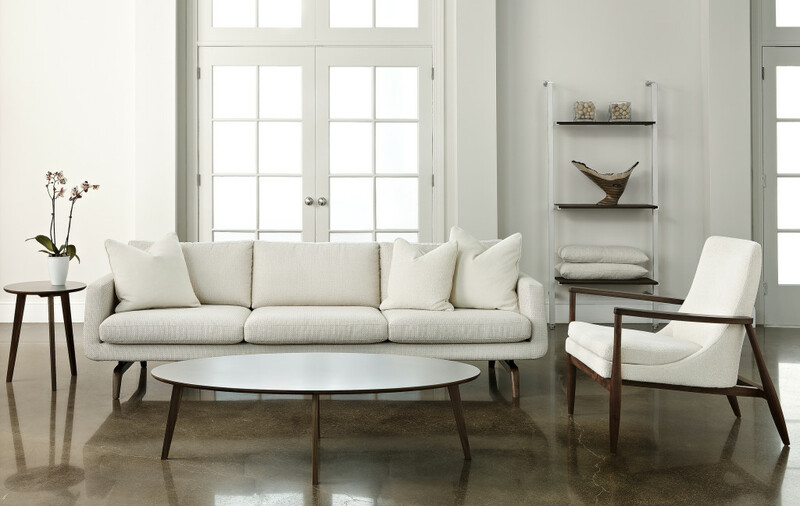 These 3 new styles have Mid-Century styling and modern comfort. There is a choice of over 500 fabrics that can be applied to these styles. For great Mid Century sofa styles like these and many more stop by Saugerties Furniture on Main St in Saugerties. We’re open 7 days a week and our family would be happy to help you find the right style and fit for your home. 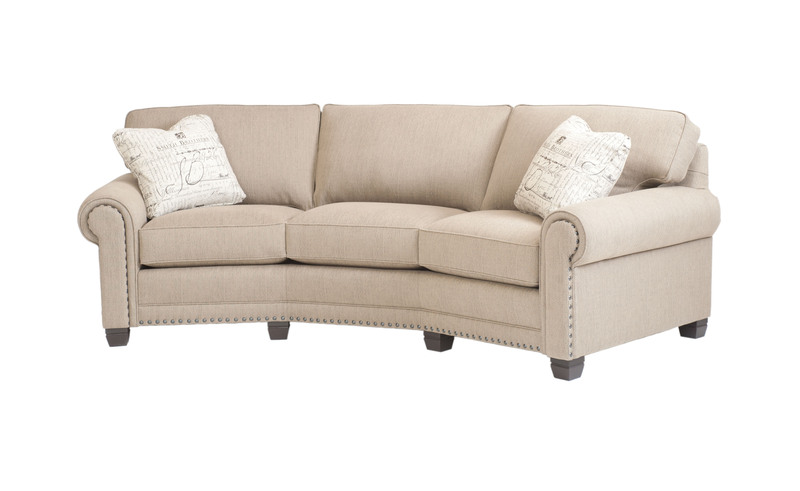 Click here to learn more about the Claire sofa. 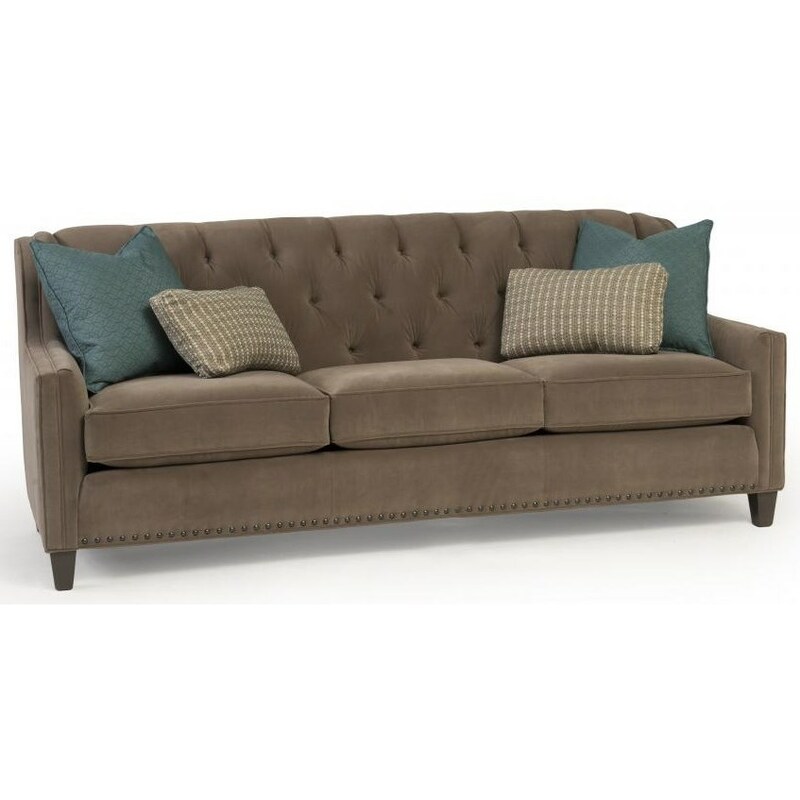 Click here to see more about the Dorset sofa. Today we received Canadel’s latest collection – Gourmet Custom Dining. 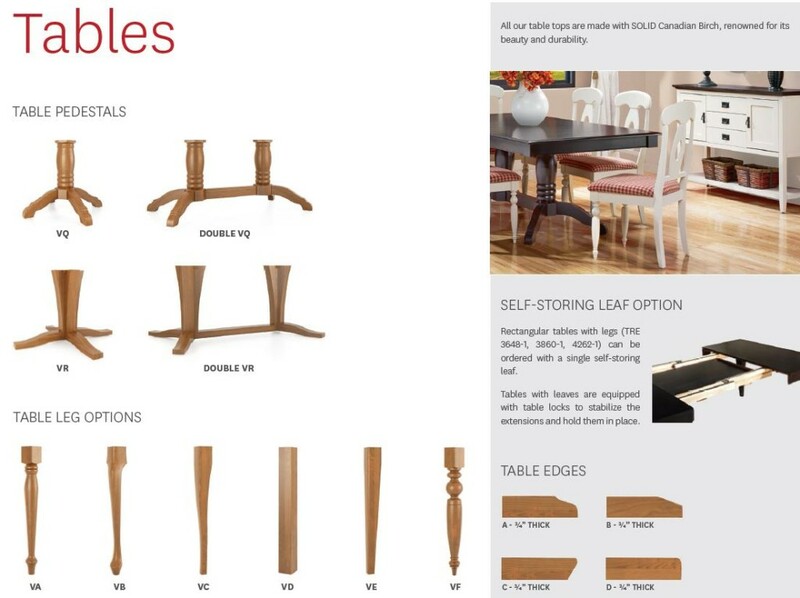 Gourmet is best described as a “Canadel -Lite” or “Canadel for the Kitchen” custom dining furniture program. Solid Canadian Birch tops and seats are finished with Canadel’s famous worry free catalyztic finish for years of stain free use. The chairs are four-way finger jointed and bolted together for strength and durability. Choose from solid top or 1-leaf tables in a variety of shapes: rectangular, round, oval and square dining tables are available. Customize your set by choosing the chair, leg and table edge to compliment your style. Fabric Parson chairs are available too! The BEST PART of Gourmet is that there are 10 chair choices all at THE SAME PRICE! No upcharges to make the table and chair set the way you want. 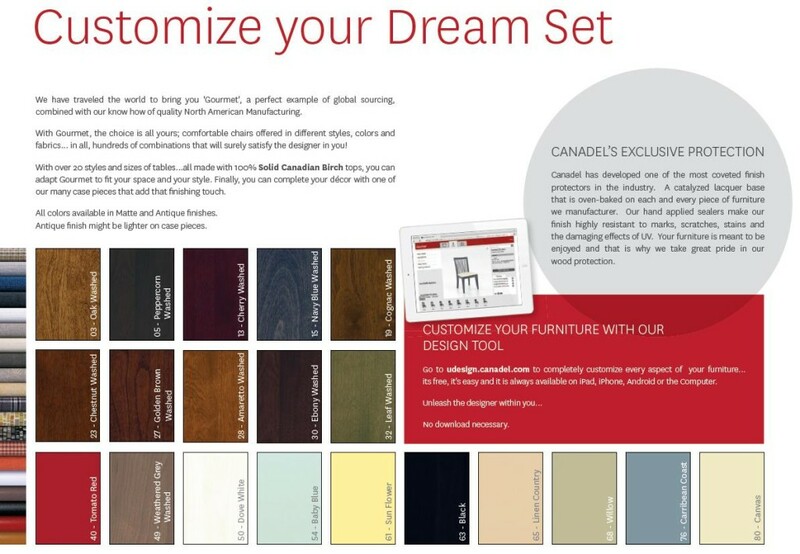 Solid wood, a worry free finish, and the ability to customize your style for no extra charge makes the Canadel Gourmet Collection a great addition to our floor. Stop by Saugerties Furniture Mart on Main St. in Saugerties 7 days a week for to shop for your new dinette set! Click here for more Gourmet Dining options!